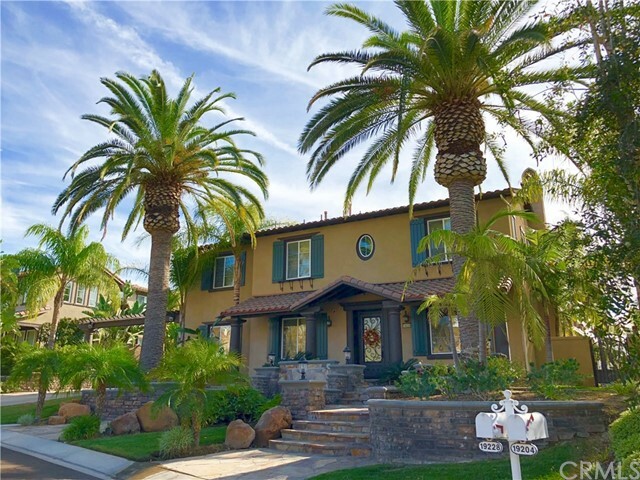 All Yorba Linda homes currently listed for sale in Yorba Linda as of 04/20/2019 are shown below. You can change the search criteria at any time by pressing the 'Change Search' button below. If you have any questions or you would like more information about any Yorba Linda homes for sale or other Yorba Linda real estate, please contact us and one of our knowledgeable Yorba Linda REALTORS® would be pleased to assist you. 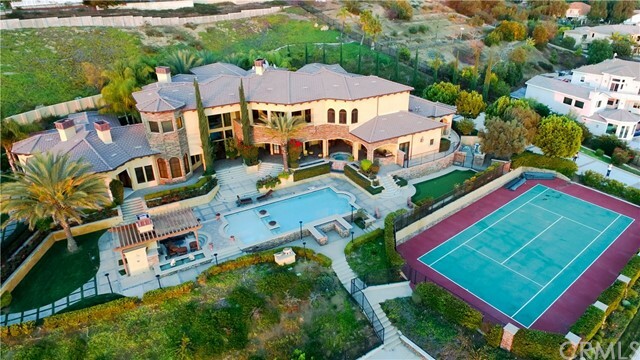 "One in a lifetime opportunity to purchase an original style Tuscan Estate in Orange County. 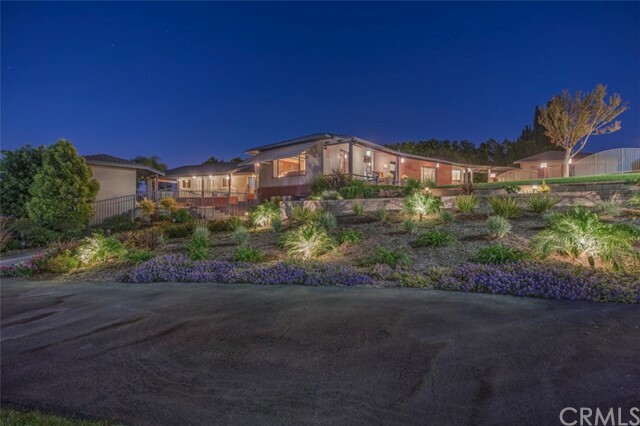 Extremely rare parcel sits atop a sprawling 5 acres with breathtaking 360 degree views of gorgeous city lights, The Catalina Islands, as well as Disneyland s majestic fireworks display. Lush grounds feature towering palm trees and exotic greenery planted in strategic locations. Custom iron gates opens up to private driveway. Interior displays opulent one-of-kind design including custom floors, wrought iron railings, and made-to-order mill-work thru-out. Grand Chef s full granite kitchen with altitudinous 30 barrel ceilings, exquisite custom built cabinetry, complete with top of the line appliances. Executive office/library suite with fireplace and partitioned additional office. Main floor master suite features a private deck, personal gym and retreat. Master bath boasts dual wet and dry sauna and automatic fireplace. Other amenities include state-of-the-art 10 seat home theater, billiard and poker parlor enters onto private deck with views. Luxury salt water pool includes swim-up bar and Baja Shelf low end. Outdoor covered kitchen and living areas near pool equipped with built in BBQ, refrigerator, 1.5 bath with shower and regulation tennis court. Use of the finest materials and masterful design evident thru-out palatial home that includes liberal use of marble, granite, travertine and distressed wood." "View..... View..... View! The best promontory view available in North Orange County. Breathtaking city light all the way to Catalina Island! Designed by an amazing architectural firm, This masterpiece features walls of glass to enjoy the unparalleled city light and view of Catalina Island. This property is totally different from anything you have seen before, a magnificent Estate boasting 9320 sq.ft 5bedroom, guest quarter, great room, media room, master suite with wrap around balcony, office, exercise room, exercise lounge, home theater, wine room, pool, spa and 4 car garage. The courtyard provides California outdoor living at its finest! Relax comfortably by the outdoor bar and fire feature. This type of Estate opportunity does not come around often. This is a rare find and an incredible opportunity to build an even larger Estate or a mother in law quarter if you so choose. This modern Estate in on 3.2 mostly flat acres overlooking those amazing views. Plans are Avail. 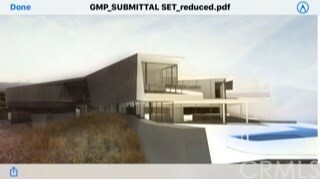 NOTE THE PROPERTY IS CURRENTLY A LAND PARCEL HOWEVER THAT THE LISTING INCLUDES THE BUILDING OF THE SPECIFIED STRUCTURE." "Welcome to this amazing home in one of Yorba Linda's most prestigious neighborhoods, the gated Manor House at Kerrigan Ranch. Offering nearly one acre of flat and usable land along with 7,500 square feet of highly-appointed living space, this home boasts entertaining options both inside and out. It has five bedrooms, six full and two-half bathrooms, a family room, formal living and dining rooms plus a bar and office downstairs and a loft upstairs. This home is designed for family and entertainment! The huge gourmet kitchen boasts custom made cabinets and granite counters. Directly off the kitchen there is a casual dining area along with a prep area which includes another built-in refrigerator. The expansive master suite has dual walk-in closets and every single closet in the home includes custom made wood organizers. The backyard has a large covered patio perfect for entertainment, BBQ island, over-sized pool with waterfall and large grass area. The detached casita is approximately 800 square feet and is currently being used as a gym and game room but is also perfect for extended family or guests. There is garage space for four cars as well as a plenty of space for RV parking behind your own private gates. This home is in close proximity to Yorba Linda High School along with the new Yorba Linda Town Center offering shopping and dining options." "Truly an amazing property that has it all! Boasting one of the most spectacular backyards you will ever see, featuring an incredible outdoor kitchen, covered dining pavilion, gorgeous rock-accented pool, and sprawling grassy lawns set on a generous over 3/4 acre parcel. This inviting estate is perfect for multi-generational living with a separate 1,800 SF custom-built guest home, finished with the quality amenities featured in the main estate. Situated in the prestigious Manor House gated community offering tremendous curb appeal. Pride of ownership is evident throughout, with handsome wood flooring, and an inviting open floor plan boasting a desirable downstairs master suite. Gorgeous granite kitchen presents a full complement of quality stainless appliances and lies adjacent to the spacious family room with warming fireplace. Upstairs features three additional en-suite bedrooms, plus a sprawling bonus room with built-ins. The separate guest home offers a large living room with fireplace, granite kitchenette, plus upstairs loft and private en-suite bedroom. Outdoor entertaining amenities include rarely available Teppan grill, beer kegerator, plentiful meal prep areas and convenient half bath. Gated RV parking with full hook-ups, plus garaging for four vehicles. Attends the award-winning Yorba Linda High School. This home will surely impress!" "True luxury and quality of life awaits you with this one of a kind estate. The exquisite amenities and craftsman touches in this home are beyond compare. Enter through the electric gate into the porte-cochere to be greeted by your own waterfall to one side and grand staircase leading to the ten foot tall wrought iron double entry doors on the other. In this home, you ll find rich hardwood flooring, artisan wrought iron work, Travertine tile, and soaring open beamed ceilings to compliment the spaces. Stunning wood work throughout this home is the labor of a master craftsman and includes eight foot tall solid wood doors. The master suite is an oasis of its own. Towering ceilings and rough wood beams compliment a space that includes: Double sided stone fireplace, kitchenette, wraparound balcony with estate views, expansive walk-in closet, and a well-appointed master bathroom. The family room includes sliding glass walls to let you embrace indoor-outdoor living. The pool area has rock formations that create a grotto for the spa and a breathtaking waterfall that fills the space with the soothing sound of running water. The grounds also include: A guest house, 5-car upper garage, 2,200 square foot RV garage with 14 ceiling and pass-through doors, multiple lawns, stables, and a horse turnout. The neighborhood includes: Riding trials, parks, dining, shopping, and award winning schools. You will know you have arrived in your own luxury estate in the Land of Gracious Living." "Live everyday like the Four Seasons in one of the most incredible estate homes that will leave you breathless! Located in the new guard-gated community of Enclave on one of the best premium view lots. This chic, stylish and confident estate boasts uncompromised quality with the finest of amenities. Soothing fountains and double door entry lures you into contemporary grandeur of completely open clean line design and lavish living. From the entry rotunda, ascend the stairway to the show-stopping master suite with private view balcony, luxuriating bath with centrally located spa tub, dual vanities, and double walk-in Hollywood closets. The upstairs is completed with two additional en-suite bedrooms, loft/game room and laundry room with downstairs executive office and main floor en-suite bedroom. Gourmet chef s kitchen is equipped with large double islands dressed with quartz counters, top-of-the-line stainless steel appliances and floor-to-ceiling espresso cabinets opening to the enormous great room. The wall of glass disappears to reveal your private resort and unobstructed city and mountain views. The rear yard is an entertainers dream with no expense spared. The beach entry pool with baja shelf is surrounded by glass tiles and spillways, outdoor party cabana with separate in-ground spa, entertainment bar, linear fireplace, heaters, seat wall, fire pit and separate covered outdoor kitchen. Why spend more and wait on the model and when you can move right in!" "Huge price drop for quick sale!!!! This fabulous Toll Brothers View Estate residence in prestigious Amalfi Hills. Owner spent 1 year to upgrade. It has extremely luxury design Palace like front yard with unique design fountain fixture and iron gated courtyard. Custom wrought iron entry door leads to an elegant entry circular foyer w/soaring high ceilings with exquisite chandelier and medallion accented extra thickness Marble floor all through. Main floor has two suites. One large suite with own access to the side yard. Media room/office is next to the living room. Formal dinner room connected to the Gourmet Kitchen w/expensive island w/ granite counter-top. Chinese wok prep kitchen. Walk-in pantry. Floor to Ceil windows at family room to enjoy the lush backyard view. Private 2nd stairway gives convenience path from upstairs bedrooms to the kitchen. Exquisite huge master bedroom has balcony with breathtaking city light and Catalina Island view. Extra-large lavish master bathroom with soaking tub and shower area. Oversize walk-in closet with custom designed build-in drawers and cabinets. 2nd floor has another spacious bedrooms. Luxurious Resort like back yard features sparkling pool and spa w/waterfalls. Luxurious ancient roman style patio and BBQ perfect for outdoor entertaining. Two laundry rooms for each floor; Solar panels, Build-in storage cabinets in Garage; RV parking...prestigious Yorba Linda School. A MUST TO SEE ESTATE." "Beautiful Mediterranean Estate located in Kerrigan Ranch! Enjoy the luxury resort lifestyle with 'Spectacular Breathtaking' backyard! Introduced by a long custom driveway leading toward a HIGH Ceiling entry way with two spiral staircases. Truly one of a kind home with Incredible indoor/outdoor flow with attention to detail finishes. Resort style living at it's finest with an outdoor kitchen and bbq with a family room sitting steps away from the Amazing pool, spa, waterfall, waterslide, and as well as a bar area to enjoy refreshments while swimming. Excellent location, away from busy streets yet minutes away from the top rated Yorba Linda High School. Do not miss out on this luxurious resort style living!" "Highly sought after Kerrigan Ranch This spacious estate boasts 6 full bedrooms and 6 bathrooms. Enter through the formal entry to be greeted with soaring ceilings and an elegant stairway. As you meander on the travertine floor on the 1st level you are accommodated with a library, bedroom with a full bath, formal living room, dining room, large family room that is open to the large kitchen. The kitchen includes ample storage, dark wood cabinets, granite countertops and stainless steel appliances. Yes you have a pantry! Through kitchen you can get to your laundry room and on the other side to your study or office. The secondary / separate staircase near the kitchen will take you to your oversized bonus room loft where you can have your own theater or game room. Right off of the entry and into the formal living room you may ascend to the 2nd level where you will find 5 bedroom and 5 baths. This estate provides you with magnificent grounds that include, pool, multiple waterfalls, waterslide, outside pool house, covered outdoor patio with a fireplace and kitchenette. Garage parking to park up to 5 vehicles inside! Kerrigan Ranch is nearby Yorba Linda High School, shopping centers, dinning, entertainment and outdoor parks." 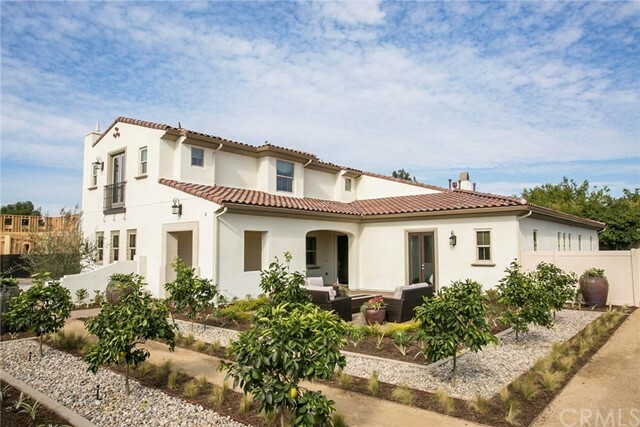 "Gorgeous single story luxury house located in the exclusive gated development of Manor House at Kerrigan Ranch. This Entertainers Dream home offering 5 over-sized bedrooms and 6.5 elegant bathrooms. Step into elegance as you re greeted with a beautiful formal living and dining room with Hand-scraped distressed wood flooring inlayed with limestone along with a soaring wood beam vaulted ceiling. Custom, temperature controlled 800-bottle wine cellar has plenty of room for you to store your wine collection. Gourmet chef's kitchen with Viking professional appliances, Cesar Stone & granite counters and an oversized center island. Breakfast dining area opens up to the spacious family room which offers built in entertainment center and custom made fireplace. Master suite with built-ins, sitting area & a romantic fireplace. The Massive backyard offers views to the ocean and includes resort like amenities such as a waterfall jacuzzi tub into the pool, relaxing fireplace and fire pit, cabana, outdoor BBQ island with sit-up bar and a full bathroom. Four car fully finished garage with tankless water heater, central vac, security system and plenty of room for RV parking. Owner spent about $200K remodeled Kitchen, all Bathrooms, flooring, etc. last year. 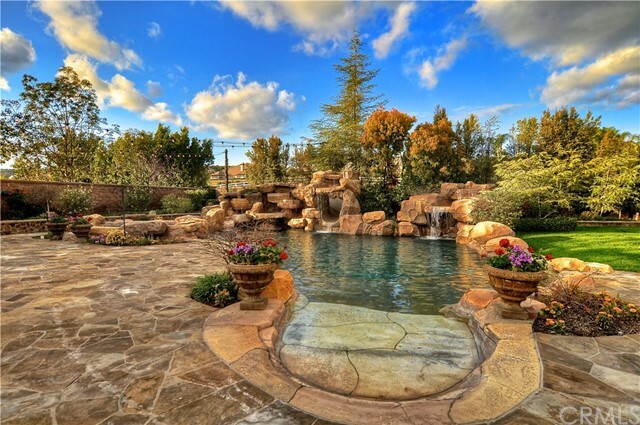 This home offering the ultimate in privacy and resort living in one of the finest neighborhoods in upscale Yorba Linda." "Amazing classic design! Panoramic View Estate! The best value dream house you can even find! This custom built home is located on a prestigious cul-de-sac; sitting on two parcels of Yorba Linda's Hidden Hills Estates. Its spacious 6500 square feet of living space is open and elegant in design. Its decorated interior is of Venetian decor, including highlights of design on ceilings, elaborate window appointments, and faux painting throughout. Amenities include: Soaring 25' Ceilings, beautiful Marble in Foyer, Winding Staircase, Stunning Columns, Five Fireplaces, All Ensuite Bedrooms, Elegant Master Suite & Retreat, Main Floor Bedroom, Back Staircase, all high end furniture could be included!City Lights & Mountain View, Stained Glass Interior Doors, Four Car Garage and RV parking. Location is Excellent! Close to Great school: Yorba Linda high!" 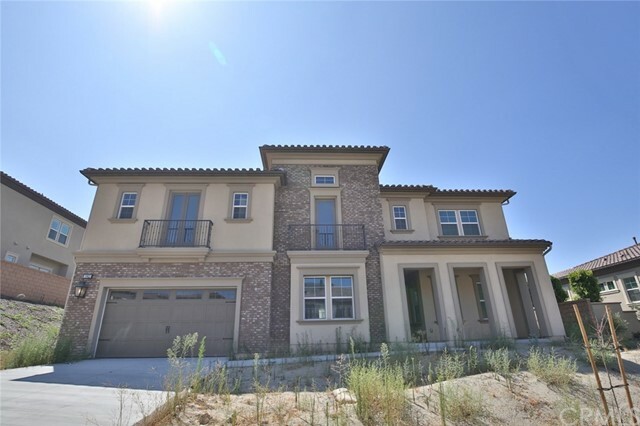 "Brand new Toll Brothers view estate residence in the heart of the Yorba Linda. Private, staff-gated community. Spacious home sites with lot premium $ 400,000 and luxurious quality with $385000 in upgrades. Features large 5 en-suite bedrooms and 1 secluded library / office. Impressive dual stair case flanks the dining room with cathedral ceiling. Enormous loft on the second floor adds a great additional living space. Wok Kitchen. Side courtyard can be viewed from office, dining room and great room. No Mello Roos, low property taxes. Award-winning Yorba Linda School District. Recreational center with a park. Near freeways, employment, shopping, dining, hospitals, Disneyland , mountains and beaches. Around the corner from Black Gold Golf Courses. Near the Richard Nixon Museum & Library, Disneyland, Angel Stadium, Honda Center, Cal State Fullerton, Brea mall, the 57 & 91 freeways, shopping and all major banks. Your dream home is a must see before it's SOLD!" "A MUST TO SEE ESTATE. This beautiful Mediterranean style home is a hidden gem in Amalfi Hills. Build in 2014, this property has never been occupied. Two elegantly upgraded master suites are conveniently located at main floor and 2nd floor separately. From the estate, you can enjoy breathtaking city light and Catalina Island view. A dramatic two-story circular foyer leads into the formal living areas. A large formal living and dining areas are designed for convenient entertaining. Well appointed and extensively upgraded kitchen boasts a large island, walk-in pantry, wok-kitchen and butler pantry. 2nd floor master bedroom suite features fireplace, balcony, grand sitting area, private shower, soaking tub and two large-walk-in closets. Four-car split garages are included in this premises. Near to Yorba Linda High School, Black Gold Golf Course and long walking trails, not to mention, newly opened Tokyo Central Super market and under construction Yorba Linda Town Center." "If you are looking for a home with amazing panoramic city light views on a large piece of land, best schools (high school rating 10) all located in a very safe community, then this home has all the features that you dream of! 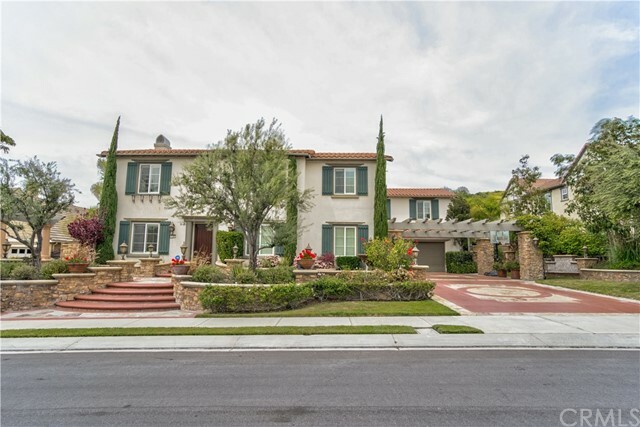 This classic luxurious home is located in the prestigious community of Mount San Antonio. Features include high cathedral ceiling looking down to the beautiful wide open entrance hall with a curved staircases adorned with wrought iron, main floor private office and a wet bar. This incredible property also includes a large family room highly upgraded with an extension perfect for a pool table, piano or play area with french doors exiting to the backyard patio and pool area. The gourmet kitchen features an over sized marble counter top, stainless steel appliances including built in refrigerator, 2 dishwashers, 2 ovens, microwave and a $3000 coffee maker. The master suite is extremely spacious with 2 extra areas: one rest area with fireplace and exercise room or nursery. The master bath is luxuriously upgraded and comes with double walk in closets. Must see to truly appreciate all this home has to offer!" "Place For Everyone Two houses 1 lot a little over an acre. Located in the Heart Of Yorba Linda. 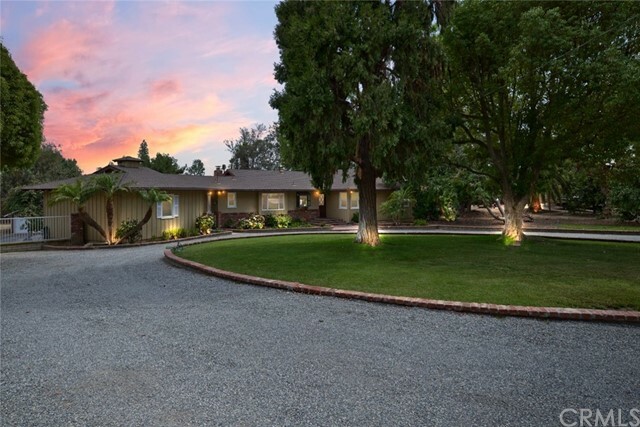 This Ranch style home sits on over an acre with another single family home in the back of the property. You own your easement. Main House 2802 sq. ft. 5 bedrooms, 3 bath, 110 ft from the street to the front door meticulously manicured and landscaped. New circular driveway with pavers and a 4 tiered fountain. Oil rubbed hardwood flooring in entry, dining, and kitchen. The kitchen features quartz countertops, black appliances, double ovens, built in refrigerator. Newer windows throughout, rock fireplace in dining room. Central heating and AC with 3 climate zones, plus a whole house fan. You enter the backyard to a lower level entertainment area, with Lynx BBQ, warming drawer, small refrig, huge tile eating bar area with bar stools. Huge Infinity Pool/Spa with a 28 ft. water wall, surround sound, pool house ( 600 sq. ft;) that has a kitchenette and full bathroom, gorgeous BBQ area with another huge tile bar, stools, TV, to host your guest plus additional parking at the pool side entrance. Right below the water wall is a glass fire pit with concrete and grass, plus a kids pirate ship play area. In the middle of all amenities are many areas to relax and enjoy all the beauty this home has to offer. Behind the pool is an additional 2nd single story home. 2 bed 2 bath 1200 sq. ft. RV Parking with full hook-ups"
"Amazing Upgraded Luxury lifestyle! Huge backyard with beautiful Pool/ BBQ! 6Bed/5full bath! additional Huge bonus room! Sliding door upgrade/Living room beams upgrade! Master closet upgraded! Master Bathroom upgraded! Build In Office!" "As soon as you walk through the door, this custom-built property will take your breath away. With creative details around every corner, you will need plenty of time to experience all that this home has to offer. You will be instantly transported to an Aspen chalet as you find yourself surrounded by the Knotty Alder wood doors, cabinets and trim, which are perfectly complimented by the enormous stone fireplace and finishes in the great room. There is no compromise here; you can have luxury as well as security in this estate. Recently re-built in 2006, the new design utilizes Steal Beam construction, and Anderson doors and windows. The owners have created a dream home with features for everyone in the family. A HUGE kitchen with granite counter tops, top end appliances, and a pot-faucet, as well as a home office with a fireplace of its own are spectacular but included in THIS home you will also find a room already wired for a home theater, 2 tank-less water heaters, 2 separate laundry areas, and LAUNDRY SHOOTS! Some amenities were just meant to be shared to be truly appreciated No one will turn down an invitation when you are entertaining in your very own PUB! But whether simply relaxing on your own or entertaining many, you are NOT restricted to the indoors! Outside you will find a 4.5 car garage/work space, RV parking and a covered patio that features a built-in BBQ which overlooks the beautiful pool and spa area. This uniquely enchanting property must be seen to be believed!" "$200,000 Reduced! Prestigious estate with FANTASTIC city light views! 6 bedrooms and 6.5 bathrooms. 5425 sqft. , 3-car garage. Impressive entry featuring travertine floors with medallion, soaring ceilings, and a grand staircase. Views can be enjoyed from the living room, the formal family room which opens to the chefs kitchen featuring top of the line stainless steel appliances, custom painted cabinetry, granite countertops and large island. Wood floor throughout the house. Dual master bedrooms on each floor, Downstairs 2 guest bedrooms with its own bathroom. Upstairs an open loft leads 3 large bedrooms with their own bathrooms. Professionally designed landscaping with BBQ, salt water pool, and spa. The neighborhood is conveniently located just a few miles from the 55, 57, and 91 freeways, Disneyland, the Brea Mall, the mountains and the beach. Top-rated Placentia/Yorba Linda Unified School District, including Lakeview Elementary, a California Distinguished School. No Mello Roos, low property taxes, and HOA fees." "Get ready to fall in love!! An amazing home with incredible indoor and outdoor ambiance. Gaze upon the gorgeous rolling green hills every day from the grounds of the home that includes sparkling pool, spa and inviting BBQ center. Tremendous attention to detail is evident in every square inch of this inviting property! Gorgeous curb appeal, pristine landscaping, and a very private location add to the desirability of this estate. Grand gourmet kitchen offers granite counters, a full complement of top-of-the-line appliances, convenient center island, plus walk-in and butler's pantry for seamless entertaining. Formal living and dining rooms, separate office or game room, custom wine closet, en-suite bedroom and generous laundry complete the lower level. The main sweeping staircase leads to additional upstairs bedrooms plus open loft and second family room area. Sumptuous master suite boasts a separate retreat, inviting private view balcony, oversized walk-in shower, and dual vanities. A second staircase leads to the secondary bedrooms. The incredible backyard will be the favorite place for family and friends to gather to enjoy warmer days ahead. Inviting outdoor fireplace, stone finishes, raised planters and a sunny patio, ideal for sun-soaked days or evening star-gazing. Tandem two-car garage offers parking for four. 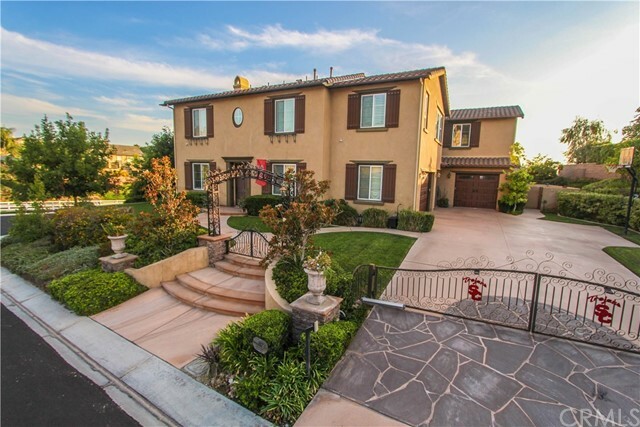 Situated on over 18,000 SF flat lot and attends the desirable Yorba Linda High School." "Welcome to Silverleaf, an extraordinary new home community with impeccable taste, expansive floorplans, inspiring features and coveted livability for growing families in scenic and tranquil Yorba Linda This 4-bedroom, 4.5 bath new home, has up to 4,728 square feet of living space with soaring two story ceiling in the great room that showcases large sliding doors that open to back yard Loggia. The Gourmet kitchen has a large food preparation island with lots of counter seating. The master suite and bath are secluded and has access to the backyard loggia. A guest room and office at the homes entry finish the first floor. Upstairs in a bonus room and 2 additional ensuite bedrooms. The 4 car garage is over sized and has additional work space area. The acclaimed Yorba Linda School District, plentiful shopping, dining and entertainment venues make Silverleaf the perfect location." 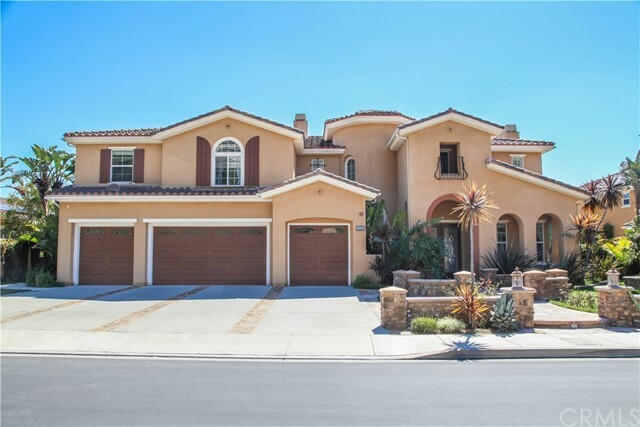 "Beautiful custom built home located in the heart of Yorba Linda in one of the most prestigious and desirable neighborhoods. This stunning home is nestled on over 1.1 acres and features 6 bedrooms, 7.5 baths and over 5600 sq ft of living space. It is an entertainer's delight with an open floor plan perfect to host parties and guest inside and out. The chef in the family will be amazed with the gourmet kitchen that has two islands, double oven, Silestone counters, Sub Zero refrigerator, and commercial grade stainless steel 10 burner range. You will not want to leave the luxury of your master suite where you can sit by your cozy fireplace or take in the views of the pool and gorgeous hills from your balcony. Other amenities include a sauna that fits 8, an office, a workout room and a laundry/craft room with tons of storage. There are plenty of spaces to gather family and friends from the formal dining room to the warm and inviting living room to the family room the opens to the kitchen and leads you out to the brick patio. Out back you can enjoy the sun while you lounge by the sparkling pool. The backyard is private and has sprawling lawns and plenty of lush trees and alluring landscaping. Large outbuilding is every car enthusiasts dream that features a workshop, massive amounts of storage, separate bathroom, and ample room for numerous vehicles and restoration projects. This is the perfect family home close to award winning schools, and the soon to open Yorba Linda Town Center." "Back on the market, better hurry before it is gone again! 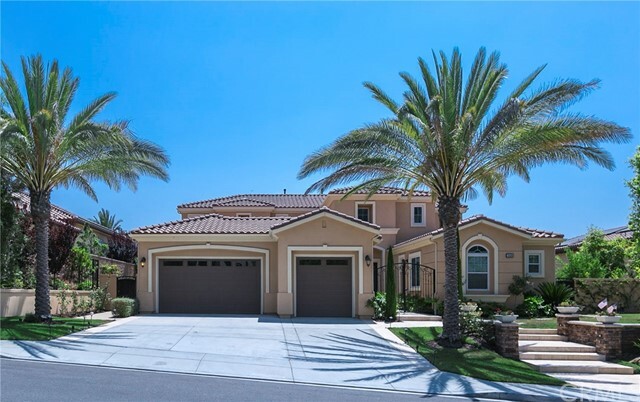 Stunning curb appeal and located in Yorba Linda s most prestigious and desirable neighborhood - Kerrigan Ranch! Like a priceless Rembrandt, your new home is painted against a backdrop of rolling hills and enjoys panoramic lighted views across Orange County, to the glossy shimmer of the Pacific, and Catalina. This 6 bedroom, 5 bath estate exudes luxury throughout. The private half acre lot has only 1 single story neighbor, offering the utmost in desirability. One bed and bath is located on the main level, along with an office, formal living and dining rooms, a music room or den, and the most amazing gourmet kitchen that lives up to Master Chef standards. Take note of stunning custom crown and double crown molding. Upstairs, the master suite enjoys unobstructed views, dual huge walk-in closets, and a redesigned master bath that would rival a spa at any 5 star resort. Discover the bonus room, up the stairs, off the kitchen that currently accommodates a theater and game room. This home is perfect for entertaining. The breathtaking backyard is unbelievable. Salt water pool, spa, dual gazebos; one complete with TV and fireplace. The outdoor kitchen surpasses most homes indoor kitchen and even has its own wine refrigerator! Don t miss the new insulated garage doors complete with WiFi app, electric gated driveway entry, video camera surveillance retrievable on you phone, and paid solar panels (bills of $600-800 per yr)." "In the heart of Yorba Linda,2 flat usable acres is truly a rare find! Properties like this just don't usually come on the market.These 2 - 1 acre parcels have the potential of becoming the estate a discerning buyer has dreamed of.The primary lot has a lovely mid century ranch style home with over 2,000 square feet,a large barn & showroom.The second parcel has an avocado grove & citrus trees.There's even a historic building on the property from the earliest days of downtown Yorba Linda,that was grove keeper cottage on Lakeview.This property is surrounded by an eclectic blend of multi-million dollar homes & some homes dating back to the early 1900s.A circular driveway is in front of the existing ranch house,& the home itself has a beautiful family room with wood beam ceiling & used brick fireplace & a remodeled kitchen with rich wood cabinetry,wood plank flooring & breakfast nook.There are 3 spacious bedrooms,the master with a private bath,a full bath off the hall,powder room,laundry room & living & dining rooms.A bonus room is in a basement area with access to a covered patio.When you decide to build your dream estate,the existing home is a perfect guest house.The barn & showroom are ideal for a car enthusiast,with room for 12 or more cars,and for an equine enthusiast,the property is also zoned for up to 8 horses.A developer could even build 2 stunning estates,each on 1 acre.Separate parcel #s for each lot means no need to subdivide. Don't miss this exceptional opportunity!" "ENTERTAINER'S DREAM HOME! SPECTACULAR TOLL BROTHERS VIEW ESTATE WITH UNOBSTRUCTED, BREATHTAKING VIEWS OF THE CITY LIGHTS AND CATALINA ON A CLEAR DAY. Custom touches include travertine flooring, crown moldings, and plantation shutters. A gourmet kitchen opens to a spacious family room and features designer cabinets, granite counters, Monogram stainless steel appliances, breakfast bar, and large center island. There is a convenient enclosed wine cellar room with stone accents. There is also a downstairs office complete with a custom desk, built-in filing cabinets, and shelving. A downstairs private guest room as well! Two separate staircases lead upstairs to the Master bedroom and three additional rooms with their own bathroom. Elegant master suite with a sitting room, private balcony with a panoramic view, and a tranquil master bathroom with jetted tub, walk-in closet, separate his/her vanities, and a walk-in granite shower. Outdoors you will find an entertainer's paradise. Enjoy beautiful views as you jump in the refreshing pool and jacuzzi with a rock waterfall feature. There is a large outdoor covered gazebo featuring a beautiful custom stone fireplace, hook up for a TV and also features a bar complete with a Viking built-in barbeque, 2 gas burners, and a refrigerator. Amazing hillside location near the Redwood Grove, Carbon Canyon Regional Park, and Black Gold Golf Course. No Mello Roos and No HOA."